As a designer I am frequently invited to people’s homes to discuss their requirements in the garden. Many, who have contacted me with landscaping projects in mind, simply want A patio, or A deck or A driveway and it must be THIS shape and must go HERE, THERE and THERE: but if we look at the garden in it’s entirety as part of our property; then it becomes another room – albeit an outdoor room. I wonder; would people upgrade their old and worn out bathroom by simply replacing the bath alone? It might be a whopping great shiny bath but would it not outshine the rest of the bathroom fittings and therefore actually make the room far LESS attractive – surely the opposite from the desired effect? These days (and especially during our current economic climate) it is essential to procure the most possible function and usability of the space we find in our properties, and with the increase in lifestyle advertisement as a result of years of generated affluence we are now readily inclined to look beyond bricks and mortar to see how our gardens can be utilised. There are of course many standard practical functions to the garden: offroad parking; children’s play; vegetable cultivation; pet’s habitat etc; but now in a fully immersed sociable and lifestyle-orientated society there are new and exciting functions which can be procured from a garden: patios and decking big enough for entertaining the whole extended family and cooking a BBQ, the extension of informal seating that can be derived from this through raised flower beds and retaining walls; a kitchen garden to feed the family or to educate the kids; a soft rubber play surface for children’s play equipment; an outdoor audio system playing relaxing music; fencing and planting for privacy while we relax on our evening patio in the twighlight with a glass of wine, gently illuminated by the garden lights and lulled softly by the bubbling of a water feature. Sound good? Well all of these ideas are concepts that aren’t really new to anybody at all but their implementation should be approached with some sense of cohesion within the space and sympathy with surroundings. Interior design is a much celebrated discipline which not everybody can get right without some advice and we have all seen rooms where curtains and sofas and cushions and carpets make for a confused and uncomfortable experience. In the same way your garden – or exterior – design should allow for materials, shapes and textures and structures to sypathise with one another to create an harmonious space which will truly let you relax, truly allow you to show off to friends and family, and truly add value to your lifestyle AND your property. My job as a designer is to ensure that the space delivered to you is suitable to your requirements as an individual and as a household. I can give you all of these different elements set-out into a fully functional, very useable and extremely attractive garden, with planting to suit your ambitions and everything you need from your property space. I don’t doubt there are plenty of able bodied folk out there who are capable of laying some slabs or building a wall but perhaps seeking a little design advice would make all these efforts FAR more worthwhile. For those niether design nor DIY inclined – we can provide all the services required. 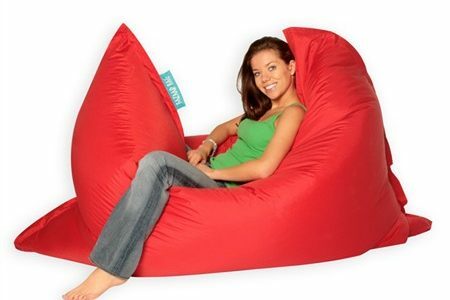 I like the idea of a garden being a flexible or at least a multi-functional area and products like these outdoor/indoor beanbags are a perfect accessory to that ideal. We have used them often in our designs as they are perfect loungers for families, and kids especially, but are particularly useful in gardens where the sun moves across the space without really staying in one area for the full day. They come in a great variety of colours to suit your landscaping. Welcome to another project article in our Garden Design Portfolio Series. This garden has been designed by Nicky Patterson and will be built by the team of garden designers and landscapers at GardenImprovements.com. The design was commissioned by Liz C from a new-build townhouse property Jordanhill in the west end of Glasgow, Scotland. The garden, as many new builds do, consisted of only a few slabs and some lawn – the slope is considerable and to enable Liz access to the top of it, a degree of terracing is indeed required. The garden is completely rectangular and since the slope is at a constant parallel with the house it’d be very difficult to instate a geometric plan without making the garden seem like an over-sized stairway. To combat this and reduce the effect of the terracing I have decided to create some movement in the basic lines that will form the structural elements within the space. The gentle serpentine waves create motion and reduce the blatant imposition if the forced terracing in this design. Utilising the existing rectangular patio at ground level I have cut some shape into this and embedded a green slate shale gravel garden before we are faced with the first of two retaining walls. The stairs will be cantilevered into these walls giving the appearance of floating steps which will further reduce the emphasis of structure within what is a confined space. The view from the top down obviously foreshortens the depth of field but allows Liz to look down toward the house through layers of planting which creates a much softer aspect for what is a dominating building in height and width (being a terrace). The patio is designed to allow for a table and four chairs and is set amongst some of the taller shrubs and trees within the garden, allowing some privacy form the wandering eyes of the public in the area behind the back fence. It will be constructed from a modern concrete textured slab which offers a perfectly flat surface and some contrast to the ragged textures given by the slate shale. The stairs have been positioned to allow Liz a journey through the garden rather than simply having a steep climb from A to B. The shapes offered by the walls and other hard-standing structures allow us to plant in balancing weights creating an overall sense of serenity and achievemnet in what is ultimately a garden designed for relaxation and reflection from hard work!! We are looking forward to starting this project in the near future!! In recent years decking has become one of the most popular additions that UK gardeners have sought to install. The provision of a nice area to relax, have a drink or do some barbequing is attractive and current figures suggest that one in five of us have at some point undertaken a decking installation project. However, if you fail to plan your project effectively it is likely that you could end up with decking that is not child safe. Here we offer useful tips on how to avoid such an outcome. One of the most common causes of injury involving children and decking is due to the fact that spindles have been placed too far apart. This can result in the child either falling through the rails, or becoming trapped between them. Where the decking is raised there is the chance of the child falling a long way and children stuck between the spindles run the risk of suffocation. You can avoid the risk of either of these occurrences happening by ensuring that spindles are spaced no more than 99mm apart. Also, be sure to avoid spindles that run horizontally (ie ranch style); as they could provide a ladder for children to climb up and over the decking rail. If you have raised-decking then, it is likely you’ll have some stairs leading from it down to the rest of your garden area. At some point your child will reach an age where you trust them enough to be able to negotiate the stairs on their own. However, until they reach that point the unprotected stairs offer the opportunity of injury sustained through falling. The safest option is to either make or purchase the required number of gates that can be attached to the decking balustrade. Be sure to fit childproof latches to gates to keep your child safely in the decking area. In many instances, decking is built on uneven garden surfaces, or has to be placed on stilts so that the decking is level with French doors. The base area underneath the decking floor presents a space that your child is sure to want to explore if it is left unprotected. Your first option here is to add decking boards or other suitable wooden sheets and stain it to match the decking. This has the additional advantage of preventing pests, making a nest under your decking. The second option is to fit some trellis to fill in the gaps underneath the decking. If you are concerned pests may try to make a home under the structure then you may want to consider attaching some chicken wire to the trellis to prevent access. Going down the trellis route leaves you with the option of training climbing plants and creepers to it to add to the aesthetic appeal. Usually the finish of decking products will be pretty smooth. However, there is always the chance of splinters when working with timber and especially so when you are cutting pieces to fit. Therefore, once you have finished installing your decking it is advisable to spend a little time smoothing off any rough edges or surfaces with some sandpaper. Ensure the handrail is at a minimum of 900mm from the deck level for ground level decking. If your decking is above 600mm off the ground then the handrail should be set at 1100mm to reduce the risk of falling over the top. Whilst our last tip doesn’t specifically relate to the installation of decking; it is one that we can’t leave out. It is imperative that you always place any patio furniture as far away from the edges of your decking as is possible. Children love to climb and if your furniture is close to the edge there is always the risk that they will attempt to use it to get over the decking rail. Being new to the landscaping and design business it was always going to take me a while to get used to the different aspects involved, none more so than the design process; fiddling about on the laptop with the design software we use was all well and good- but it couldn’t prepare me for the real life problems presented by an actual client and project. When Nicky informed me that i would be sending off my own design and presentation I was a tad nervous about the outcome to say the least! It didn’t help that the garden I would be designing for was a very strange shape and quite large. When doing practise designs I found it alot easier to come up with ideas for smaller gardens, so this was the first stumbling block! I tried to fit in everything that the client had wanted, but ended up with a mish-mash of a design with no real flow throughout the garden, so it was back to the drawing board! I needed some inspiration, so took to the web to see if i could find it there. I wanted to have my own style in the design so found it quite difficult to look at other designers’ designs and ideas without thinking that I was cheating, so it was to the reference books next! This proved a bit more successful as they not only have designs and techniques in them but tips and ideas on how to create gardens of all shapes and sizes which was exactly the kind of help i needed. I came to realise that the design concept is the same, whether for a small town garden or in my case a large oddly shaped country garden, just different scales. So once i had got my head round the size and shape it was onto the design itself, which proved just as difficult. The clients themselves live in a modern farm conversion in the country with cracking city views of glasgow, so my problem was trying to fit in the rural rustic surroundings, the clients modern style whilst framing the city landscape in the distance. Not much then! Taking into consideration the clients needs for certain things in the garden; utility area, patio, water feature, i decided to try and mirror the view from the house in the garden. I tried to achieve this using different heights in the centre of the garden with hedges and walls, and fibre optic lights embedded in the patio, to reflect the city view, and with different size lawn mounds either side of the central ‘city’ area to replicate the surrounding country hills and farmland. Considering the materials was also important so it was back to the books to find the perfect gear. I would say that this stage of the process was probably the easiest due to the fact that the house was very modern so to tie in that to the garden was just a case of trying to use nice clean modern materials, like black slate for the patio and crisp white gravel for the pathways. So i was happy with my design, next stage- the dreaded presentation! Now I’m not the most confident of people so this was terrifying for me to say the least! It was a case of sucking it up and getting on with it really, no books to help me there, and in the end it wasn’t so bad! It’s out the road now anyway, first one under the belt as they say. I came across a few problems and it took me longer than i would have liked but its all part of the learning process i suppose. I’m looking forward to the feedback but not as much as i’m looking forward to the next set of problems….. I mean designs!